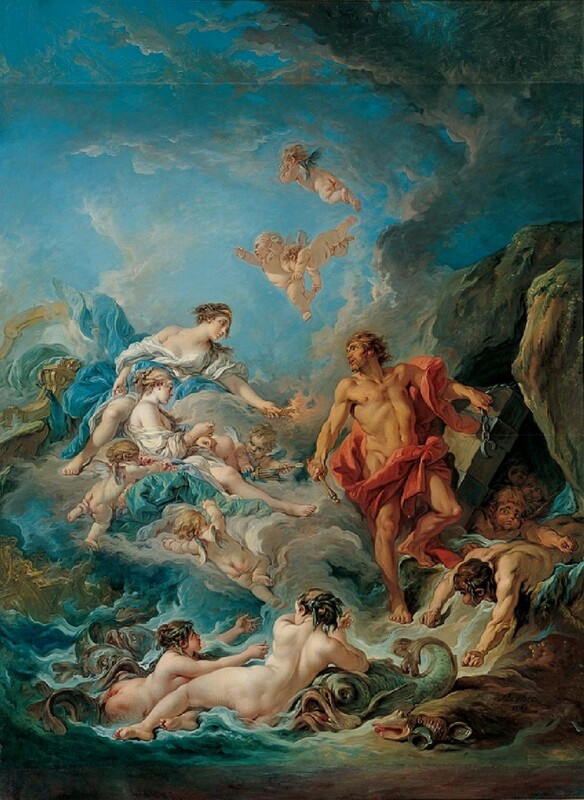 François Boucher' s Juno Asking Aeolus to Release the Winds is all about Juno’s rage against the Trojans. She hates them so much. She hates their stupid ships. She hates their stupid armor. She hates their stupid faces. She just hates them. “But why?” you may ask. Well, because there is this rumor (prophecy) out there that someday the Trojans are going to destroy her fave place, Carthage. Also there was this beauty contest that Paris (a Trojan) was the judge of that she lost to freakin’ Venus. Just because she’s the goddess of love or whatever. It was rigged. Anyways… Juno’s main mission here is to convince Aeolus, the keeper of the winds, to release the winds so that Aeneas, who is about to found a Trojan colony in Italy, would be blown off course. She does this by offering him her prettiest nymph, Deiopea, in holy matrimony. Deiopea is depicted here with her hands bound by a string of pearls about to be hit by one of Cupid’s arrows. It’s not an awesome position to be in, and probably not exactly what she had dreamed her wedding day would be like, but Juno is determined to get the winds out there to royally mess up Aeneas’ life/fleet. Aeolus, meanwhile, has Juno’s fiery torch pointed at his chest, while he unleashes the winds. The winds are so out there and you can see in the bottom left corner, Aeneas’ fleet is getting, quite literally, wrecked. They are not handling their sh*t well and Juno is about to get some popcorn and a soda and watch it all burn. That is, until Neptune steps in and stops the madness. All things must come to an end I guess. This painting is one of six massive paintings that Boucher did for the wealthy Parisian financier, Jean-François Bergeret de Frouville in 1769. It was passed down through massive inheritance after massive inheritance, was looted by Nazis, returned to the family who owned it, and finally sold to the Kimbell Art Museum, who now owns four of the six paintings that were made. It stands at 9 feet tall and over 6 feet wide as a very unsubtle statement not to mess with Juno. "Juno Asking Aeolus To Release The Winds - François Boucher - Google Arts & Culture." Google Cultural Institute. Web. 7 May 2018. "Juno Asking Aeolus To Release The Winds | Kimbell Art Museum." Kimbellart.org. Web. 7 May 2018. Shmoop Editorial Team. "The Aeneid Book 1 Summary." Shmoop. Shmoop University, Inc., 11 Nov. 2008. Web. 7 May 2018.